After New Year's Day celebrations subside, January in Amsterdam is imbued with an unmistakable post-holiday calm. Visitors are free to alternate between the outdoor chill and the cozy, climate-controlled indoors; brisk walks around town are a treat on clear days, and when the wintry climate loses its appeal, travelers can find respite from the cold in museums, cafes, and restaurants. The city is as tourist-free as ever this month, but even in the off-peak season, Amsterdam still offers a full calendar of fantastic events and activities, from yearly festivals to memorable one-offs. Seasonal perks are also in full supply—from ice rinks to koek-en-zopie stands (the catch-all term for rink-side refreshments)—and you won't want to miss cold-weather staples such as stamppot or oliebollen before the warmer months roll around. 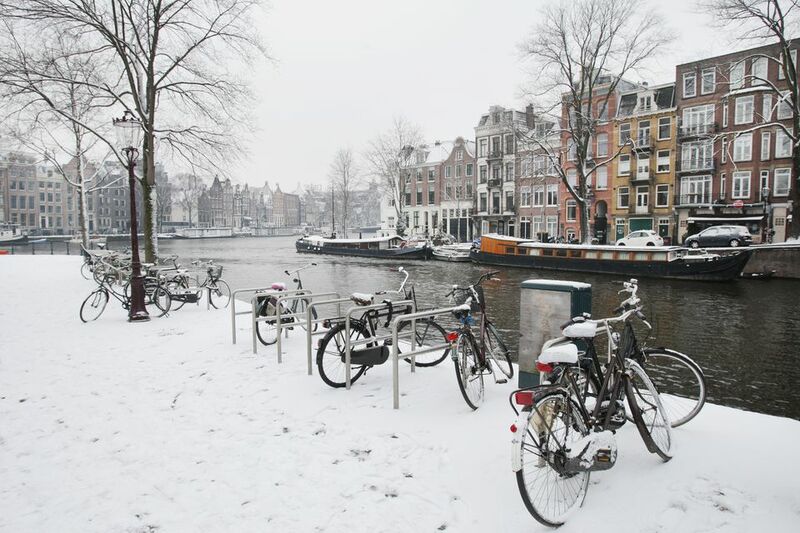 January is the coldest month in Amsterdam, making it one of the least busy times of the year for tourism. The city experiences an average of eight days of rainfall this month, accumulating a total of 2.7 inches of rain between them; however, you won't likely encounter snow as the weather is typically a little too warm for snowfall. Additionally, you can also expect overcast days for most of the month, with an average of just two hours of sunshine per day. Layers are key to staying warm and comfortable on your trip to Amsterdam this January; you'll want to bring plenty of sweaters, long-sleeved shirts, pants, and maybe even thermal leggings or undergarments to help fight off the brisk cold—especially if you plan on visiting any of the city's outdoor attractions this month. Gloves, scarves, warm hats, and a heavy winter coat will also be necessary, but you should also bring a raincoat and waterproof shoes since it rains about half the month. Although the colder weather does keep some revelers indoors most of the month, Amsterdam has no shortage of annual events and celebrations happening in January each year, starting with all-night parties to ring in the new year on New Year's Day. New Year's Day: As in most countries worldwide, January 1 is a national holiday in the Netherlands and a day to recuperate from the high jinks of New Year's Eve. Note that many tourist attractions and other businesses will be shuttered for the day, but there will still be parties happening in bars and venues across the city. Amsterdam International Fashion Week: Amsterdam's semi-annual fashion week is the top event on the capital's fashion calendar, and its "off-schedule" events ensure plenty to see and do beyond the catwalk. While official Fashion Week events are for industry insiders only, Fashion Week DOWNTOWN puts on exhibitions, shows, launches, parties, and more for the broader public. Impro Amsterdam: The International Improvisational Theater Festival, or Impro Amsterdam for short, presents a six-day series of performances at Amsterdam's Rozentheater, where teams of actors from Benelux, Brazil, Germany, Canada, Japan, New Zealand, the United States, France, and elsewhere come to extemporize in front of live audiences. Jumping Amsterdam: This annual Dutch equestrian tournament is sure to please hippophiles with its bevy of handsome horses and skillful riders. Top athletes in a number of horse sports return annually to compete before an enthralled audience in an intimate atmosphere; besides the competitions, horse shows, merchandise, food and drinks, musical entertainment, and special children's shows round out the event. Paradiso Korendagen (Choir Days): Featuring 140 different choirs for nearly 24 hours' worth of choral performances, the immense variety of international choirs treat listeners to pop, jazz, folk, soul, and world music for a low price of admission; tickets are available for sale at the door or online. Airfares and hotel rates are at their lowest in January, as companies try to attract customers with competitive rates. The tourist crowds are also at their yearly low, so January visitors have the run of Amsterdam's popular museums and attractions. January is a top month for sales in Amsterdam, with discounts of up to 70 percent; clothes aficionados will love the combination of the semi-annual sales with another semi-annual phenomenon: Amsterdam Fashion Week. While some businesses—especially government-related establishments like banks and federal offices—will be closed for New Year's Day, there are no other federal holidays in January, so most attractions and offices will be open the rest of the month.